Wir waren auf einer Sightseeing Tour in Rom mit anschließender Weiterreise nach Orvieto. Das Ho(s)tel war wirklich prima! Man lebt dort wie ein Römer! Die Gastgeber waren sehr freundlich und hilfsbereit. Das Zimmer war gut ausgestattet und sauber. Jederzeit wieder..
We had a fantastic stay at the Bluehostel and would recommend it to anyone! Very quiet place, newly renovated and the location is excellent - from there you can do everything by foot. Hercules and Andrea are very friendly and helpful and it was very nice to meet them. 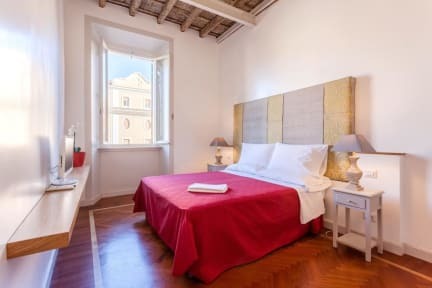 The next time we visit Rome, we will definitely go back to the Bluehostel again.